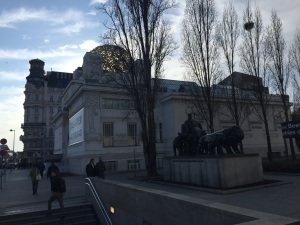 As expected, the Austria’s Advisory Committee (Der Beirat gemäß § 3 des Bundesgesetzes über die Rückgabe von Kunstgegenständen aus den Österreichischen Bundesmuseen und Sammlungen, BGBl. I Nr. 181/1998 i.d.F. BGBl. I Nr. 117/2009, (Kunstrückgabegesetz)) issued a decision on Friday with respect to the Lederer family’s claim to the famous Beethoven Frieze. In a lengthy opinion, the Committee recommended against restitution, prompting widespread speculation about what the claimants would do next. 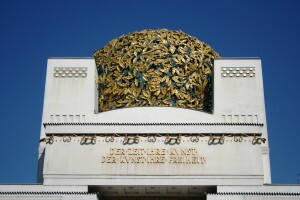 The mural is installed at Vienna's iconic Secession Museum (my photograph of the museum exterior, taken today, is below), and is one of the icons of fin-de-siècle Vienna. Der Standard in Austria reported this week that a recommendation is expected on Friday in the claim by the heirs of Erich Lederer to the famous Klimt Beethoven Frieze in the Secession Museum in Vienna. The issue in this case is not a Nazi-era theft per se, but the effect of Austria’s post-war restitution law, which returned ownership to the Lederer family (it was looted from Erich Lederer under the Nazi) but forbade export, leading to a sale. The Lederer family has argued that that amounts to a second taking. As I made no secret last week with regard to Germany’s intended National Cultural Property Designation for the Welfenschatz that my clients have sued to recover, this kind of export prohibition is now recognized for what it is: an effort to hinder restitution. The same kind of claim was made against the Leopold Museum in Vienna for Portrait of Wally, namely, the allegation that the post-war sale was not valid under the circumstances because of the export prohibition. That case settled in 2010, the painting remains in Vienna. There was a curious non-development today in Austria concerning the dispute over Gustav Klimt’s famed “Beethoven Frieze” located in the Secession Building in Vienna. At issue is whether a post-war sale by Jewish survivors to Austria of a famous painting that the law of the time did not allow to be exported can be considered a sale under duress and justify restitution.